Browsing through the Modern Churches of the UK flickr groups I discovered these images of Our Lady, LiIllington by Adian McRae Thomson. This is one of my all-time favorite flick groups because it often leads to the discovery of remarkable yet obscure parish churches all over the UK. 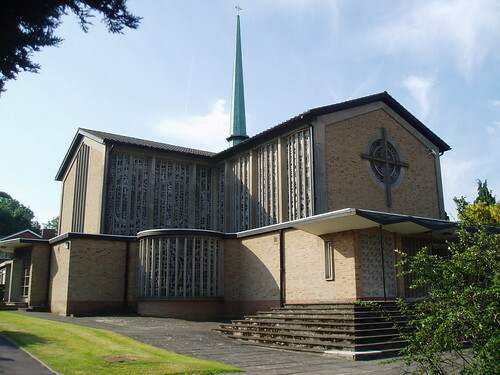 Most of these are but sparsely published as they are not necessarily architectural masterpieces and have many of the issues common to small local church buildings, but the general body of anonymous modern parish churches in the UK seems to me to be far superior to the corresponding body here in the States. 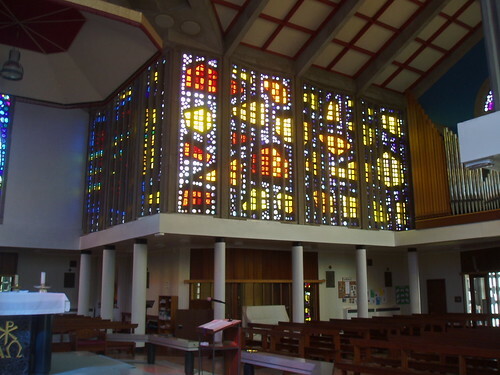 Today's featured building is remarkable for its "dalle de verre" stained glass, a common mid-century technique for abstract windows constructed from slabs of glass set in a thick concrete grout matrix. (Mr. Thomson who posted these photos is himself a maker of stained glass). Although the building as a whole is far from perfect, it is an excellent example of the unifying effect of taking a dominant characteristic of aesthetic element and not compromising its integrity. It is also a redemption for me of the dalle de verre, which too often looks like a cheap substitute for fine stained glass when held into objectified windows too small to allow its scale resolve into a field. This application is particularly notable for the high percentage of the interior surface area. Rather than appearing as window objects set into the field of the wall, the windows themselves are the field while the structural mullions dissolve into the dominant abstract pattern. The two transept windows, which are objects set in the end walls, are the only two figural designs. The end result makes for a far more unified experience than typically seen in dalle de verre installations. The scale, in addition to the continuity, completes the effect. The form of the interior space aids in the effectiveness of clerestory (and vice versa). The entire cruciform volume sits as a complex peristyle atrium amid a broader volume. All of the entrance, side chapel, baptistry and other attendant functions occur at the lower level of the colonnade, creating a threshold into the massive central space, dominated by the central altar. The altar at the crossing focuses seating on three of the four sides. The (liturgical) east arm remains largely empty, giving an orientation to the liturgy beyond the altar's centrality. The dominance of the windows and their successful integration into the spatial form of the whole building, however, seem to alienate the furnishings (other than the altar) within the central space. The tabernacle and ambo especially seem somewhat like afterthoughts here. There is a good lesson here for making strong, unified interior spaces. A low trabeated aisle, which reads as a more "human scale" in contrast to the transcendent / vertical space, is an effective means for working in more mundane functions. Note in the photos that bulletin boards and the like behind the columns work very well. But that means that any fixtures in the realm of the sanctuary need to either be substantial pieces that can hold their own in the space or need to be integrated into a clear, volumetric composition. The latter, I think, is preferable in order to maintain their ritual function.